Arsenal's Dutch striker Robin van Persie described his sending-off against Barcelona as "a total joke" after his team's 3-1 defeat at the Nou Camp ended their hopes of a place in the Champions League quarter-finals. Van Persie, who was declared fit for the game only earlier on Tuesday, was shown a second yellow card by experienced Swiss referee Massimo Busacca in the 56th minute when he took a shot at goal after being flagged for offside. He said Arsenal felt betrayed, while club manager Arsene Wenger said he told the referee "face to face" what he thought of his decision. "The sending-off cost us the game," Wenger who had a furious exchange with the referee immediately after the final whistle, told Sky Sports. Van Persie told Sky: "My sending-off had a big influence, and in my opinion it was a total joke. "How can I hear his whistle with 95,000 people jumping up -- how can I hear that for God's sake? Please explain that." Told there was one second between the referee whistling and Van Persie shooting, the player replied: "That makes it even worse. "I could understand if there was four, five or six (seconds) in between, if you make a chip or something, I could understand, but this way, one second from his whistle to my shot is just a joke." "He has been bad all evening, whistling against us. I don't know why he was here tonight. I tried to explain to him I didn't hear the whistle but he just said: 'second yellow card' -- unbelievable. "We feel a little bit betrayed, when it was 1-1 it was all to play for." 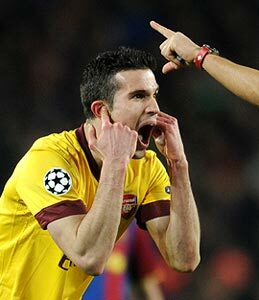 Wenger added that the referee, "must absolutely never have played football to do that. I told him what I thought about his decision face to face." He admitted that his team were beaten by "a terrific side, the best in Europe," but added: "I am convinced that if it had stayed 11 against 11 we could have won this tie tonight. It's very hard to accept."